Rembrandt had one of the largest teaching practices in his day, with at least 50 pupils studying closely alongside him in his sprawling Amsterdam studio. The curriculum included close imitations of his style and subject matter, says Lee Hendrix, the Getty curator for the show. In the 17th century, some students eventually became more famous than Rembrandt, though of course that’s not true today. 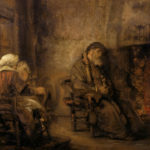 (In the latter years of his life, Rembrandt’s naturalistic style fell out of favor with wealthy patrons, who came to prefer a more flattering, less realistic painting, says Ms. Hendrix.) The Getty show features early training drawings by several of his best-known pupils, including Ferdinand Bol. 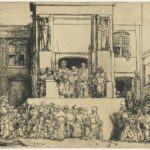 Another problem for scholars has been that although Rembrandt drew prolifically, very few of his drawings are signed. Scholars have used the signed drawings, and drawings connected to signed paintings, to find themes and symbols common to the unsigned work. These characteristics—like his use of storytelling, expressive faces and directional light— form the basis for determining modern historians which unsigned works are actually Rembrandts.